The release of the first issue of a new arc of the Eisner Award-winning series SAGA by Brian K. Vaughan and Fiona Staples is fast approaching cultural event status, driving thousands to comic stores this past Wednesday to purchase SAGA #13. Image Comics is proud to announce that SAGA #13 has sold out at the distributor level and will be going back to press immediately. Adding to the excitement, the latest installment of the worldwide phenomenon THE WALKING DEAD #113 by Robert Kirkman and Charlie Adlard has also sold out, as well as Image’s newest hit series, EAST OF WEST #5 from Jonathan Hickman and Nick Dragotta. These sell-outs mark a banner week in a year full of milestones and accomplishments for each of these series and creator-owned comics as a whole. "SAGA remains, now 13 issues in, easily one of the best ongoing comics around. Vaughan and Staples have created a world that positively seethes with vitality and creativity." "It’s no lie to say that SAGA is our best-selling comic, both in single issue format and in trades. It is also our number one subscription title, by far. Do we push SAGA? Not anymore – we don’t have to. It’s just THAT good. Our SAGA numbers only go up and every single issue has sold out. 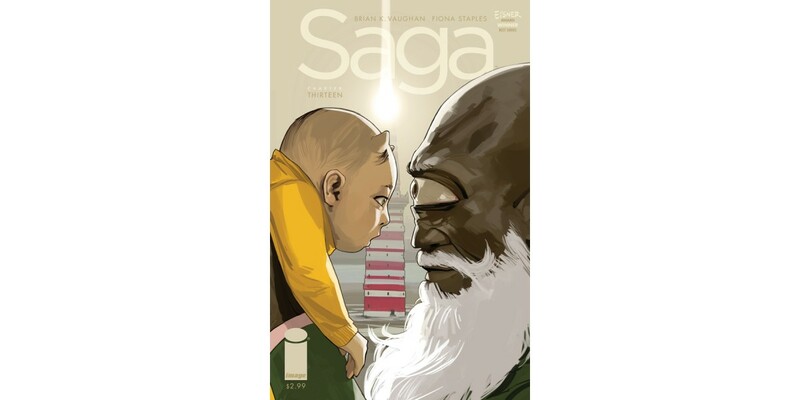 SAGA is exactly what we, as retailers and as an industry, need… SAGA is a comic book for EVERYONE and our rapidly increasing sales numbers prove that." "SAGA has returned and the people are rejoicing! The last couple months, the anticipation for issue 13 was building like crazy, and Wednesday morning was an explosion of happiness when people saw it on the New Arrivals rack. Any retailer will tell you how awesome it is to work on a day like that, where your customers are blasting the door so excited to get their hands on a great new release... they're smiling, bouncing, running, laughing, yelling, dancing, fist-pumping and giving out the high-fives everywhere you turn. Seriously, what could be more fun than that?!" “SAGA just goes from strength to strength – it is, far and away, the best-selling periodical comic in my store today, and the first paperback, with less than a year under it's belt, is already the second best-selling TPB collection in my store since I installed point-of-sale! Volume Two is already in my top 40, despite just being six weeks old!" Happy fans and retailers across the nation, perfect scores, and rave reviews make this week's sell-outs the biggest comics event of the week. Hickman, Dragotta, Vaughan, Staples, Kirkman, and Adlard have hit on something that strikes a nerve with comics readers, and the sell-outs prove that they've captured the imagination of the fanbase. Retailers may still have copies on their shelves, so fans are encouraged to contact their retailer to get a copy before they sell out at the retailer level. All three titles are available digitally on the Image Comics website and on iOS platforms through Comixology. The second printing of SAGA #13 can be pre-ordered now (Diamond code JUL138176) and will be in stores on September 25, the same day as SAGA #14 (Diamond code JUL130538). The EAST OF WEST, VOL. 1 TP, collecting EAST OF WEST #1-5, will be released on September 11 (Diamond Code JUN130466), and the next issue, EAST OF WEST #6, goes on sale September 18 (Diamond Code JUL130420). THE WALKING DEAD #114, the final issue of the current story arc and the lead-in to October’s ALL OUT WAR, goes on sale September 11 (Diamond Code JUL130549).